This Advent, gather with us in this space. Take a moment to breathe, to read very short reflections, to consider the ties between this ancient tradition and the challenges and joys of our current situation. Please hit ‘subscribe’ to join us in the contemplative journey. To go deeper, try one of the Next Steps. Last night I ventured out in the cold rain to go to The Practice for the first Sunday of Advent. We sang O Come O Come Emmanuel, its haunting melody filling the chapel. We reflected in silence, the holy space offering a chance to breathe. Advent is far more than a countdown to Christmas. The Latin adventus means “coming” and we anticipate the coming of Christ, as he did 2000 years ago, as he will in the future. And also, how he is coming into our hearts, lives, and actions right now. It’s a time of waiting, of seeking. Traditionally, a time of reflection rather than hurry. The opposite of what it has become, perhaps. Who comes? The King of Peace. As a helpless baby, born into poverty. So many who claim to be Christians follow a King of Strife, Fear and Division. They appear to have forgotten that Jesus called us to love our neighbors, and even to love those we consider enemies. We are called to be peacemakers. How? Jesus was clear: feed the hungry, visit the prisoners, welcome strangers. 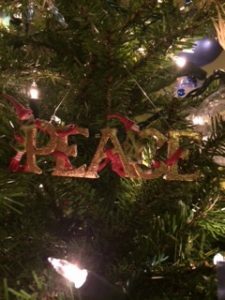 How can we, this Advent, wage peace? Listen to the hymn O Come O Come Emmanuel, listening for one word or phrase to make your prayer today. Listen to the Practice podcast here.